Before receiving treatment with CyberKnife, patients will undergo a high-resolution CT scan in order to determine the exact size, shape, and location of the tumor. This data is uploaded to the CyberKnife System so that specialists can plan and program treatment options specific to each patient. CyberKnife patients will be treated as outpatients and no hospitalization is necessary. Those receiving treatment will be placed in an isolated room but will be monitored by our board-certified radiation oncologists. Open communication is available between patients and CyberKnife team members to ensure a calm and comfortable environment. Patients can even wear their own clothing and may be allowed to listen to music. 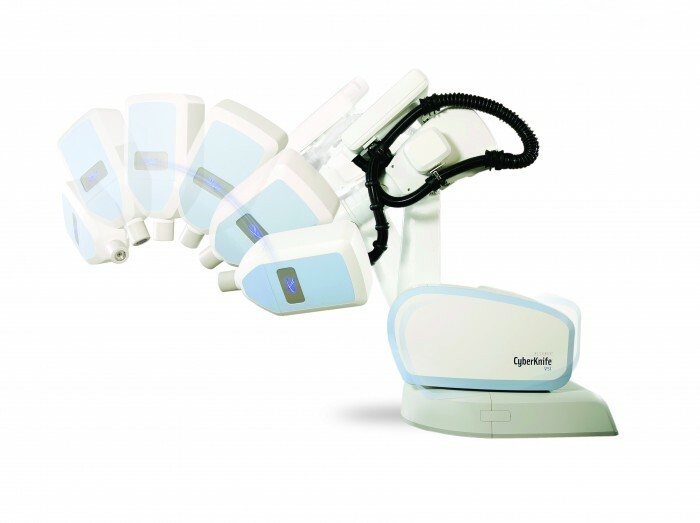 Treatment with CyberKnife does not require patients to be held down in uncomfortable frames. With the CyberKnife System, patients can lie down comfortably while the system tracks the tumor’s subtle movements. The CyberKnife System delivers high doses of radiation to specific parts of the body, targeting tumors with sub-millimeter accuracy. This system relies on real-time imaging to track tumors, allowing radiation to target tumors while minimizing exposure to healthy tissues. CyberKnife radiation treatments can be completed within five days, unlike traditional treatments which can take weeks or months. CyberKnife radiation is perfect for patients who do not want surgery or whose health does not allow them to undergo surgery as a form of treatment. This radiation can treat various types of cancer including prostate, lung, brain, spine, pancreas, kidney, and liver cancer. It is also used to treat metastatic tumors, recurrent cancers, inoperable cancers, and primary tumors. Las Vegas CyberKnife is the only cancer center in Nevada that offers CyberKnife radiation treatments. If you’d like to know if CyberKnife is right for you, please contact us today.